Rich Cards are the newest addition to Google’s enhanced search results. Using structured data in the form of Schema.org, certain types of subjects can get an enhanced presentation in Google. Rich Cards, not to be confused with rich snippets, are search results in card form that the user can swipe through and mostly pop up on mobile. At first, only recipes and movies had rich cards, but now local restaurants and courses joined the club. Let’s see what all the fuss is about. Rich Cards on Google.com (US). Rich Cards are a sort of extension of the rich search results we know as rich snippets. 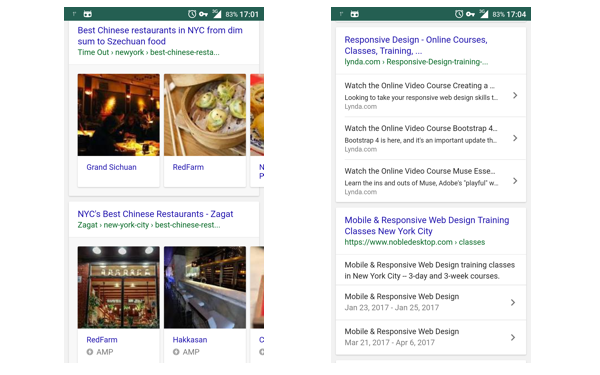 On mobile, a card is the basic presentation unit of a search result. Rich results are the search results that have extra information attached to it, this could be aggregate ratings, prices or availability. The end result is a well-structured presentation that is easy to grasp and quick to act upon. Another type of rich result offers a direct interaction with the search result. For instance, some restaurants now offer the possibility to reserve a table directly from the search result. In the future, there will be even more interaction possible, thus making for a much more user-friendly and efficient search experience. The primary driver of this type of innovation is the enormous rise in mobile searches. Mobile has eclipsed desktop and search engines are working hard to tap into the vast possibilities this brings. One of these innovations by Google is Rich Cards, where a user finds a neatly presented and quick to use search result. Swiping through the cards makes it possible to locate the result that best fits the user’s intentions. As a site owner you can make individual results available, or a list of items within a particular category. After that, a user can swipe through the results to find the best results within that category on your site. 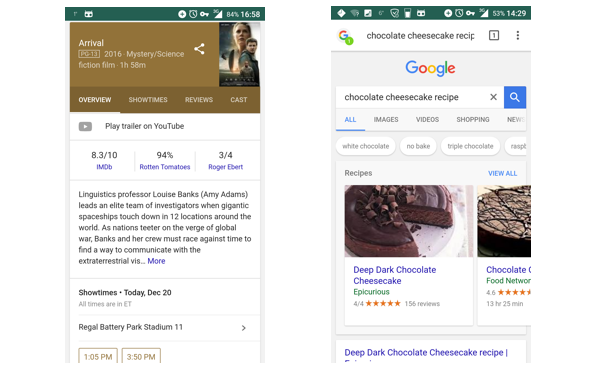 When Google introduced Rich Cards, they only made them available for movies and recipes. In November 2016, it became possible to add local restaurants and online courses. However, these are still only available for US search results. Cards present themselves in a carousel or a vertical three-pack that displays courses. Cards can be marked up individually or as a series of articles within a category of your site. To get any rich result, you need structured data on your page. Add it to your mobile SEO strategy. Just like rich snippets, rich cards use structured data to tell search engines what your page is all about, so they can use it for the enhanced presentation. You need structured data to tell search engines about the meaning of the elements on your page and not just what they say. The big search engines, Google, Yandex, Yahoo and Microsoft, came up with a shared vocabulary called Schema.org. Schema.org is often in a data format like RFDa or Microdata. However, everyone seems to favor JSON-LD these days. Not without reason, because it is easy to write and readable for both humans and machines. So structured data makes rich results possible, but it is not certain that you’ll get rich results if implemented. It’s all up to the search engines. Just make sure that your data is correct and keep your fingers crossed. To get started with Schema.org in JSON-LD, you need to determine what you want to markup and how you want to do it. There is a Schema.org for almost everything, from products to courses and services to local businesses. Be sure to take a gander at the Schema.org website to get a birds-eye view of all the schemas. If you want users to perform an action after they have found your search result, you should determine what this action should be and how you should handle it. If you do, it is possible to reserve a table in your restaurant or a buy a ticket for a movie in your movie theater. Actions are in a pilot program, but you can express your interest if you’d like to join. See this Google page for more information on that. In Google’s documentation, you’ll also find great example code to get you started, for recipes for instance. Google is increasingly pushing AMP, even in the rich search results. 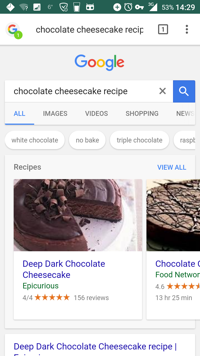 A search for [chocolate cheesecake recipe] on mobile shows two carousels, the one on top with regular search results to be swiped through. The second one, somewhat further down the page, consists of AMPlified content and makes it possible to swipe through the results, even after tapping on a link. It makes for a beautiful and fast experience, but AMP is not necessary to get this type of rich card. However, you do get a few benefits; Google likes sites that use AMP, plus your site loads lightning fast and the swiping actions are solid. AMP is very much a work in progress, and Google is figuring out how to incorporate it into the search results. 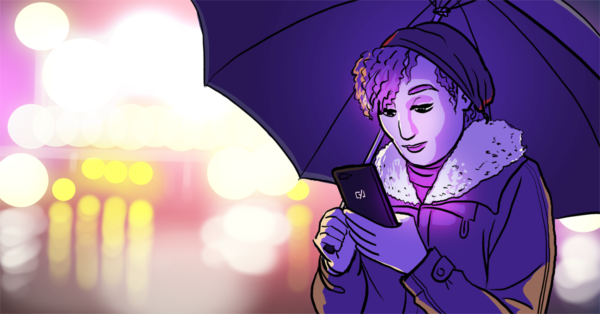 There will be a lot going on in the coming months, and we are trying to keep you informed on all of the changes in the SEO/structured data worlds. 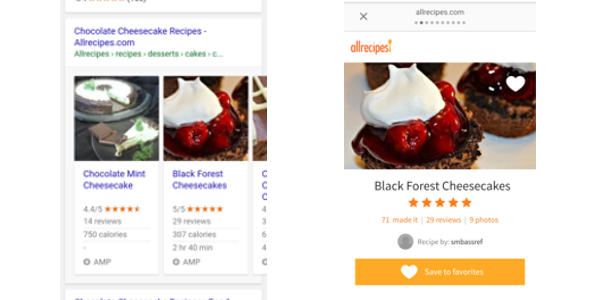 Left: an AMP carousel with only recipes from Allrecipes.com. Right: a tap leads to the relevant AMP page. One interesting recent development is the new Rich Cards report in Google’s Search Console. In this new tab, you will find everything related to the performance of your structured data. You can see how many cards are indexed and if there are critical or non-critical problems. Cards fall into three categories: ‘Invalid’, ‘Enhanceable’ or ‘Fully Enhanced’. If your cards are invalid, you should check the structured data and fix all problems. Enhanceable cards have only non-critical errors in the additional, optional data fields. These cards will still display, but not in the most optimal way. Fully enhanced cards render correctly and perform as they should. Keep an eye on your report at all times and fix issues when they pop up. Before you add your code to your pages, you should always check it in the Structured Data Testing Tool. In any case, you should follow the rules, because failing to do so and presenting incorrect data, could harm your site. Mobile rich cards offer searchers an intuitive way to browse the search results. Cards are very visible and naturally catch the users eye, begging for a tap. Carousels group the relevant results together and make them swipeable. Well, I have been searching for it from months and expecting it to open for public in coming days. I have worked in Schema part already and waiting for it to be done!! Hmm this is very interesting and something I have to do more research on for 2017. 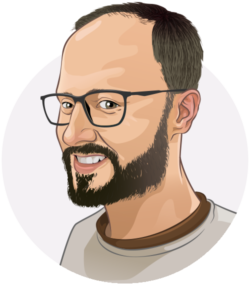 Thank you Yoast Team. I wonder if the Rich cards are generated automatically by Google or do you need to configure them somehow to show on Google? Like you said JSON-LD seems to be the favorite, except for Pinterest. For recipes to be picked up by Pinterest you either need to stick with Microdata or side load Microdata with JSON-LD. Here is the current documentation https://developers.pinterest.com/docs/rich-pins/recipes/? Hi Anthony. You are right Pinterest is still holding onto Microdata. Let’s hope they’ll switch to JSON-LD in the near future.